Don’t miss the last few weeks of the $399 Oculus Rift + Touch summer sale! Oculus Rift + Touch sale for $399! 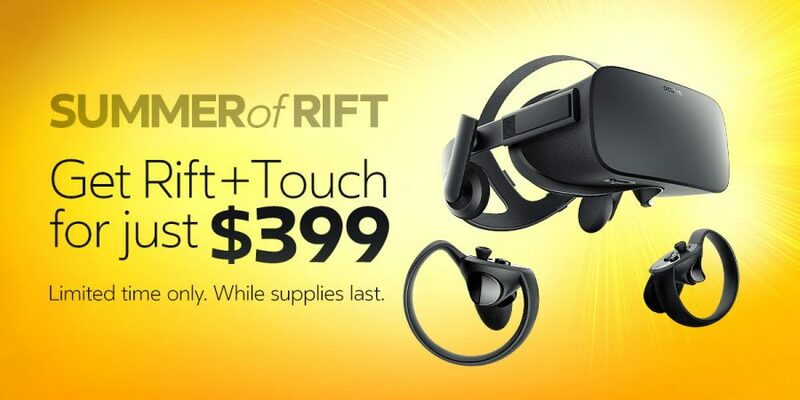 If you have the slightest interest in VR, you should not miss the biggest sale in VR: Oculus Rift + Touch for $399 — at this price, it costs even LESS than a PSVR…! IN A NUTSHELL: IS IT WORTH GETTING? I’ve had the HTC Vive, and I currently have the Oculus Rift, Playstation VR, Samsung Gear VR, and Google Daydream. In terms of tracking accuracy, HTC Vive and Oculus Rift are now very similar and both are ahead of the PSVR. Between the Rift and the Vive, the Vive’s tracking advantage is that it’s easier to setup with larger rooms. On the other hand, the Rift has the advantage of asynchronous spacewarp which allows it to run more smoothly on lower-end hardware compared to the HTC Vive. The main differentiator besides the $400 price gap is the software. Without a doubt, the best VR games and apps are for the Oculus Rift and Touch. It’s true that Oculus is now allowing HTC Vive to use Rift software, but if you get the Rift, you’ll get free games that are more polished and higher quality than the software bundled with the Vive. Moreover, Oculus has now opened Oculus Home to run games for Steam VR / HTC Vive. Some readers have so much money that the $400 difference between the Rift and the Vive is a drop in the bucket. If that’s you, then the summer sale is no big deal and you can ignore it. For everyone else, here’s my suggestion: if you’re not sure, you can buy it at the sale price and sleep on it. Amazon’s return period is 30 days. BTW, don’t be intimidated by the need for a VR-ready PC. If you have a recent i5 or better with 8GB of RAM or more, you probably just need a graphics card, such as the modest GTX 1050 4GB or better. And even though Oculus says you need USB 3.0, it actually works on USB 2.0 as well (even the headset). You won’t need USB 3.0 unless you bought a third sensor. And no, you don’t need a third sensor to get roomscale VR. Here is how to set it up for roomscale with just 2 sensors. If you have any questions about the Rift or VR, pls. let me know in the comments! VR Price Wars: HTC Vive $200 price drop to $599! Deals: Oculus Rift + Touch more affordable than ever at $399! Now costs less than a Playstation VR!